The Tree of Life (Figure 1) is intended to symbolize the entire universe, a proposition so vast in its implications that some may doubt that such a symbol is even possible. 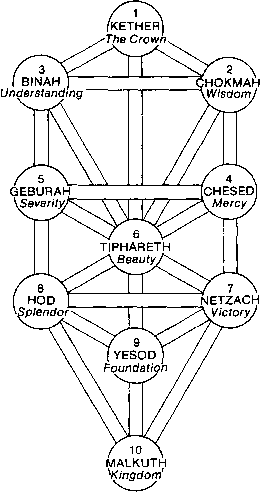 It is a deceptively simple diagram composed of ten spheres called Sephiroth, and twenty-two connecting lines called Paths. 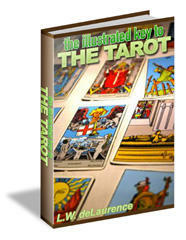 Collectively, the Sephiroth and Paths are called the Thirty Two Paths of Wisdom. Between Binah and the next Sephira is an invisible Sephira known as Daath, or Knowledge. It is not represented on the Tree, because it is a bridge, built by each individual across the Abyss existing between the upper Sephiroth and those below. The Tree of Life, used by modern Hermetic-Qabalists, was first published in Kircher's Oedipus Aegypticus in 1652 (Figure 2A). And while this Tree must have undergone a lengthy development, its historical roots appear buried in the secret past of Mystery religions. Moreover, a general developmental sequence is difficult to establish as Jewish Qabalists espoused different forms of the Tree. The first reference to a "Secret Tree" is in the Bahir, appearing in France around 1200. If, however, one were to draw a Tree on the basis of that text, only eight of the ten Sephiroth, Binah through Malkuth, would be included, since the Tree is stated to grow as it is watered by Wisdom (Chokmah). Something of the amorphous spirit of that first Tree is found in the diagram published by Robert Fludd in 1617 (Figure 2B). Yet is is curious to find that a glyph of one hundred years earlier (Figure 2C) is far more conceptually developed and sophisticated. Moreover, we find that a Jewish illustration from as late as 1708 (Figure 2D) takes a different approach, indicating its dependence on the Sepher Yetzirah. Figure 2. Development of the Tree of Life diagram. A) Form of the Tree in Kircher's Oedipus Aegypticus, 1652. B) Adapated from Robert Fludd, Complete Works, 1617. C) Illustration from Porta Lucis, Ausburg, 1516. D) Illustration from Pa'amon ve Rimmon, 1708. The most that can be said with certainty is that the Tree of life has evolved over the centuries, following ever increasing public interest and, not coincidentally, reflecting the perspectives of contemporary philosophy. 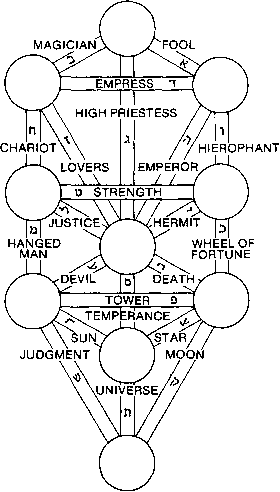 The full-color two-dimensional Tree of Life (Plate I) is the most developed expression of the nineteenth century Hermetic-Qabalah. 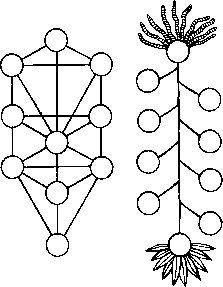 If the evolutionary pattern continues, it is likely that the three dimensional Tree of Life (Plate II) is the form under which the Hermetic Qabalah will be considered in generations to come. That Tree embodies in its pillars, the principle of five: four balanced elements, infused with a fifth element which is Spirit.